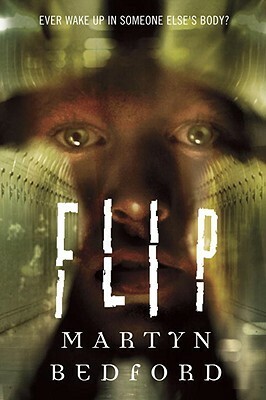 FLIP by Martyn Bedford (Wendy Lamb Books/Random House, coming April 5, 2011, publisher suggests ages 14 and up, but this could be enjoyed by mature 12 and 13 year olds). Alex Gray, a middle-class London teenager, wakes up one morning in someone else's body. Forget the similarities to Freaky Friday. While Mary Rodgers played it for laughs (and Annabel switched bodies with her own mother), Martyn Bedford takes a more serious, metaphysical approach. Alex, a quiet, unpopular kid with asthma, quickly learns he now inhabits the body of a total stranger, Philip Garamond ("Flip"), a rich, healthy, good-looking teen from the north of England. Eventually, he realizes they have one -- and only one -- thing in common. But how did this happen? Where is his own body? And can he ever get back? Should he try to get back, or should he go on living Flip's privileged life, with Flip's family and friends? Clear your schedule before you start reading this roller-coaster ride of a thriller, because you won't want to stop reading until you reach the shocking conclusion. I read this in one day. More than just an escapist thrill-ride, this book will make you think -- about consciousness, the soul and what it is, about the very nature of our existence. What makes us who we are? A great book for teens who are questioning everything. What fantastic YA novels have you read this year? Adding it to my List of Books to Get! Sounds awesome! Oooooh sounds awesome! Thanks Joanne! Hi Kim. In tone and voice, it actually reminded me a lot of THINGS NOT SEEN, which I know you've reviewed recently. Hi Donna. Thanks for stopping by! Oooh, I wants to read this! Hi Charmaine! Welcome to my blog.